On behalf of everyone at Trotec Laser, Inc., thank you for attending our booth at NBM Baltimore! The enthusiasm at the show was outstanding! Having the opportunity to meet everyone and learn more about your industries and needs is truly valuable to us, as we are constantly using what you bring us to develop new machines and features in order to better meet your needs. As a quick show recap, we revealed one of our newest machines, the Multi Color Jet, which has proven to be an excellent machine for rubber stamp producers to use along with their laser, in order to speed up their production capabilities! For more information on the Multi Color Jet visit our website our call our main office at 866-226-8505! 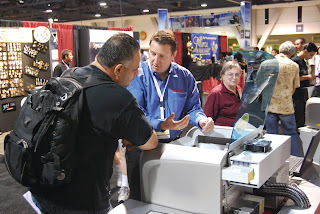 The NBM Show put on another outstanding show and as always we loved participating in all of the events! We are excited to see everyone again next year at NBM Philadelphia, where in addition to exhibiting we will be taking part in the education station... We have a lot of fun things planned for this one! For those of you who were unable to attend the show, we have many more on the horizon! Our next show is SGIA in New Orleans! For our full trade show schedule visit our website at http://bit.ly/TroShow!